No need to say that these are everyone's childhood favourite. 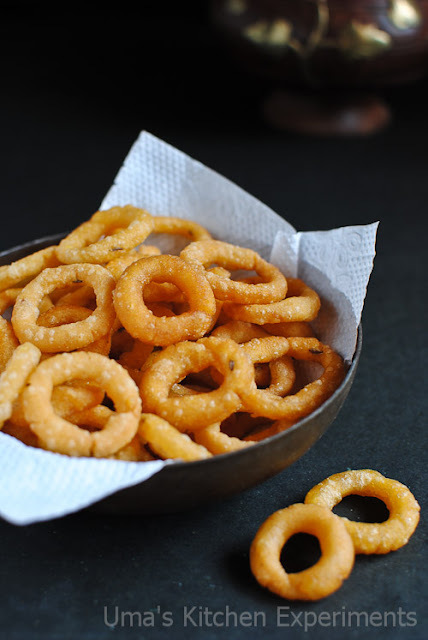 During those days, We used to have these rings in our fingers and enjoy eating them. As I used to get this from local store, I never thought of preparing it at home. But, when I talked with my grandma over phone about Diwali snacks, She suggested this recipe too along with Omapodi and other murukku recipes. But her recipe called for Maida which was not there in my pantry at the time of preparation. So, I searched some alternate for it over web. 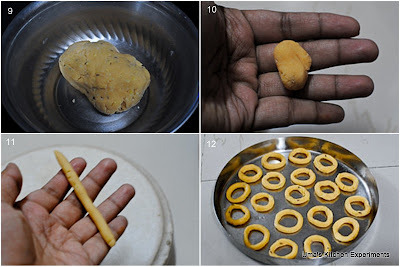 I found one traditional recipe from Srivalli's Blog without using maida and with maida. Felt happy and immediately started preparing for it. Don't hesitate to get help for making rings. Only this part took the maximum time of the entire process. Chegodilu is the telugu name of this recipe but my grandma used to say this as Chekodi. Name is not a matter. Just prepare and enjoy them. 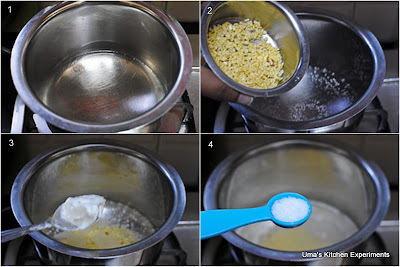 1) Wash the yellow moong dal well and soak in 1/4 cup of water. Let it it sit for half an hour. 2) Meanwhile, sift the rice flour. Keep aside. 3) Boil water in a wide pan. Put moong dal, butter or ghee and salt. 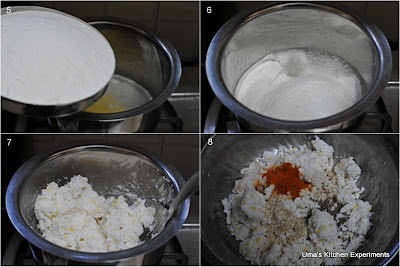 4) Add the rice flour and quickly combine it well. Turn the flame off. Cover and keep aside. 5) When the rice flour dough comes to the room temperature, add sesame seeds, cumin seeds and red chilli powder. Adjust salt if required. Make a smooth dough. 6) Apply oil in your hand and pinch a small piece of dough and make 3 inch length rope by rolling it. You can also use cleaned kitchen surface for making this. Make a ring by sealing the end of both the rope. Make sure to press it properly as it tend to break while frying. 7) Prepare the same steps for making rings with remaining dough. 8) Heat oil in heavy bottom frying pan. When the oil is hot and not smoking, add the rings one by one. You can see bubbles and hear shh sound. 9) When the rings come to the surface of the oil, reduce the flame to medium.Turn the rings to other side and cook till they changed into golden brown. 10) Remove from oil and wipe the excess oil by kitchen tissue. 1) If you are not able to form the ring shape or it tends to break, then, add little more hot water or hot oil to the dough and try making the rings again. 2) Make sure the prepare the rope in the even shape to form ring and for uniform cooking. 3) Make sure to keep the temperature of the oil is correct. Else, rings will get soggy and absorb more oil. Also, Remember each time to keep the flame on high when putting rings and turn to medium when they come to surface of the oil. 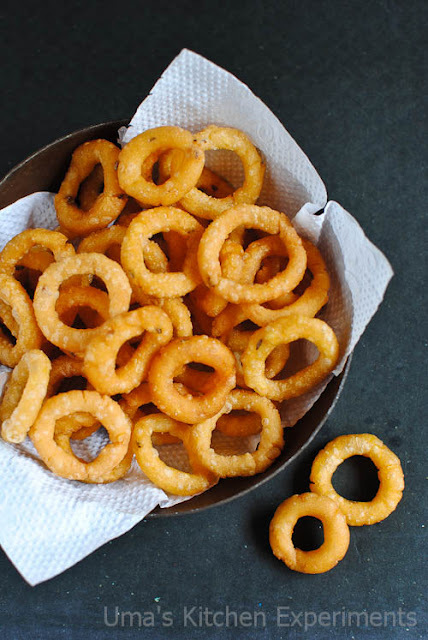 You need to follow it for perfect crispy rings. 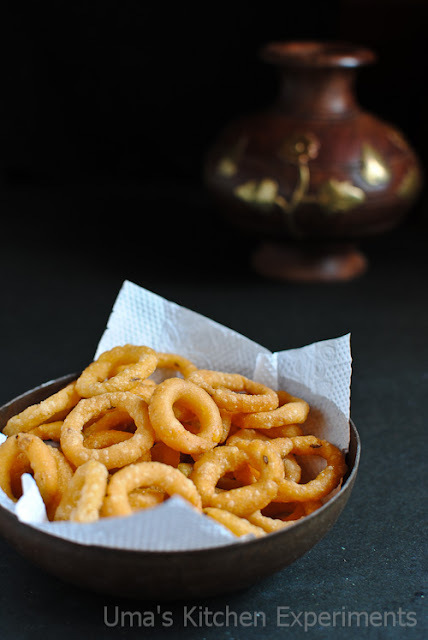 4) It took long time for me to make and fry the crispy rings. As they take little long time to fry, you can simultaneously prepare rings on the other side. 5) Cover the dough using a wet cloth to prevent the dough from getting dried. I remember the time we visited bra caves longg back. i could not stop snacking on these. you brought back those fond memories. lovely recipe and so perfectly made. I used to love what my Aunt used to make. Is this kola vadai? wow..cutee,crisp & inviting clicks !! 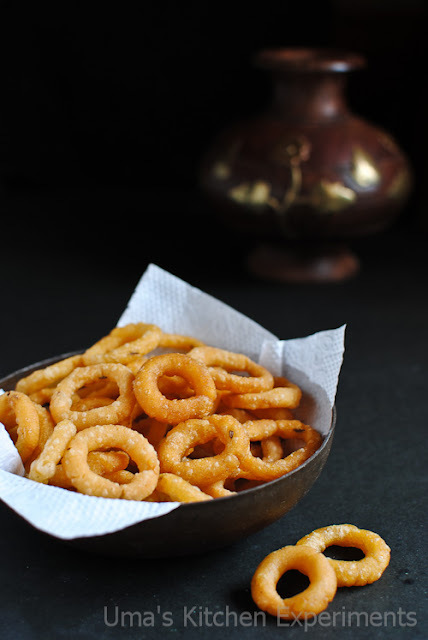 lovely and perfect.. very neat presentation..
beautiful clicks :) crispy n tempting snacks..
Love to munch these beauties,prefect and super damn cute ring murukkus. I too love this crunchy snack...looks perfect! Will try it sometime...nice clicks Uma! !